The Mekong and Nam Song rivers wind through mist covered mountains, farmland, jungle, and rice paddies. The only downside is that a lot of slash and burning goes on here, so the sun is usually obscured by a smoky haze. The roads are horrible. Since they are unpaved, it takes five times as long to get anywhere and you’re extremely lucky if your bus/van/car doesn’t break down or get a flat along the way. Lao people are some of the friendliest we’ve met on the entire trip. Everyone goes out of their way to greet you with ‘Sa-ba-deee!’ The children will come up to you on the street to say hello and will run alongside your bus or tuk-tuk, waiving and smiling until you are out of sight. Unfortunately, there is a lot of poverty here, but everyone seems to be pretty happy. It reminded us that you don’t have to have much to live a full life. Laos is the cheapest country we have been to so far. For a private room at a guesthouse, we paid around $5 a night. Beers were $1. Food was about $3 a meal at a restaurant (even cheaper if you ate sandwiches or pancakes off of street vendors). Surprisingly tasty! We figured it would be just a bunch of rice and noodles, but that wasn’t the case at all. 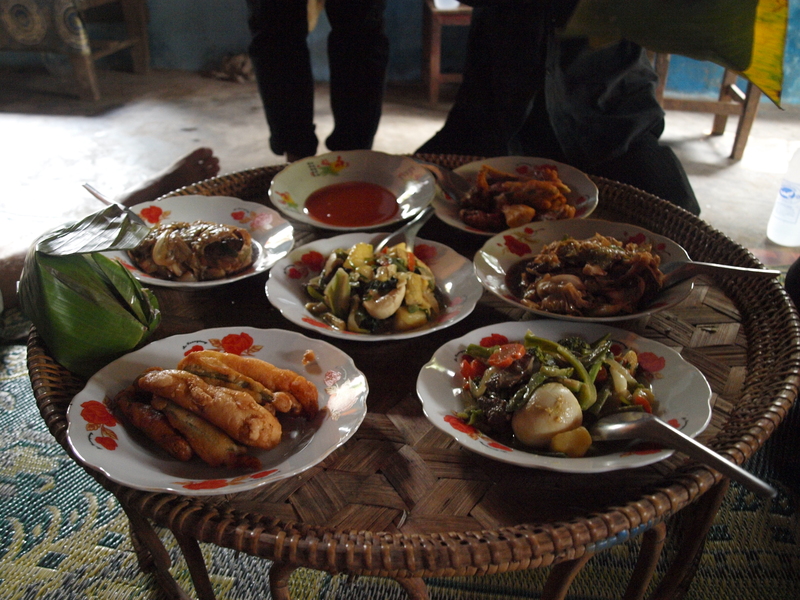 The local cuisine consists of a lot of stewed meat (mainly buffalo), vegetables, and eggs. Our favorite food was laap – minced chicken, pork, or fish mixed with mint and other herbs, served with sticky rice. On the late night, we scarfed down a couple of the street vendor sub sandwiches and pancakes…banana and Nutella pancakes are to die for!! 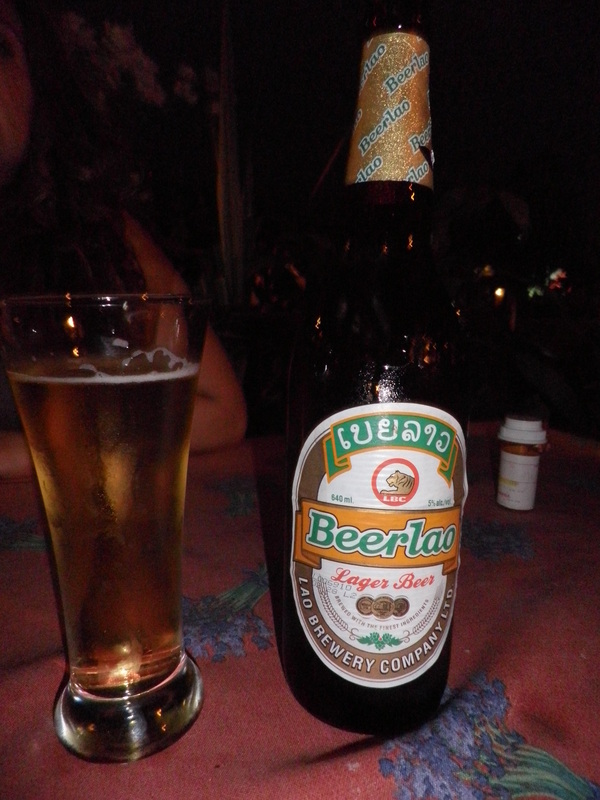 Beer Lao is one of my favorite beers on this planet. It is dirt cheap and delicious. Lao Lao, the local whiskey, is absolutely disgusting, but you’ve got to try it. Most restaurants give you a free shot before a meal…I think it is actually cheaper than the beer. -Lao is a communist country. Commie flags everywhere! -No joke – you can order joints and ‘magic’ mushroom shakes off the menus at many restaurants, despite the fact that drugs are illegal here. No comment on if any of us partook.